A firm’s Weighted Average Cost of Capital (WACC) represents its blended cost of capitalCost of CapitalCost of capital is the minimum rate of return that a business must earn before generating value. Before a business can turn a profit, it must at least generate sufficient income to cover the cost of the capital it uses to fund its operations. Cost of capital consists of both the cost of debt and the cost of equity across all sources, including common shares, preferred shares, and debt. The cost of each type of capital is weighted by its percentage of total capital and they are added together. This guide will provide a detailed breakdown of what WACC is, why it is used, how to calculate it, and will provide several examples. WACC is used in financial modelingWhat is Financial ModelingFinancial modeling is performed in Excel to forecast a company's financial performance. Overview of what is financial modeling, how & why to build a model. A 3 statement model links income statement, balance sheet, and cash flow statement. More advanced types of financial models are built for valuation, plannnig, and as the discount rate to calculate the net present valueNet Present Value (NPV)Net Present Value (NPV) is the value of all future cash flows (positive and negative) over the entire life of an investment discounted to the present. NPV analysis is a form of intrinsic valuation and is used extensively across finance and accounting for determining the value of a business, investment security, of a business. Image: CFI’s Business Valuation Modeling Course. What is the WACC Formula? An extended version of the WACC formula is shown below, which includes the cost of Preferred Stock (for companies that have it). The purpose of WACC is to determine the cost of each part of the company’s capital structureCapital StructureCapital Structure refers to the amount of debt and/or equity employed by a firm to fund its operations and finance its assets. The structure is typically expressed as a debt-to-equity or debt-to-capital ratio. Debt and equity capital are used to fund a business’ operations, capital expenditures, acquisitions, based on the proportion of equity, debt, and preferred stock it has. Each component has a cost to the company. The company pays a fixed rate of interestInterest ExpenseInterest expense arises out of a company that finances through debt or capital leases. Interest is found in the income statement, but can also be calculated through the debt schedule. The schedule should outline all the major pieces of debt a company has on its balance sheet, and calculate interest by multiplying the on its debt and a fixed yield on its preferred stock. Even though a firm does not pay a fixed rate of return on common equity, it does often pay dividendsDividendA dividend is the share of profits a shareholder receives, made on behalf of the corporation. When a company genearates a profit and accumulates retained earnings, those earnings can be either reinvested in the business or paid out to shareholders as a dividend. Types include: cash, common, preferred, stock, property in the form of cash to equity holders. The weighted average cost of capital is an integral part of a DCF valuation modelDCF Model Training Free GuideA DCF model is a specific type of financial model used to value a business. DCF stands for Discounted Cash Flow, so the model is simply a forecast of a company’s unlevered free cash flow discounted back to today’s value. This free DCF model training guide will teach you the basics, step by step with examples and images and hence it is an important concept to understand for finance professionals, especially for investment bankingInvestment BankingInvestment banking is the division of a bank that serves governments, corporations & institutions, providing underwriting (capital raising) and mergers and acquisitions (M&A) advisory services. and corporate developmentCorporate DevelopmentCorporate development is the group at a corporation responsible for strategic decisions to grow and restructure its business, establish strategic partnerships, engage in mergers & acquisitions (M&A), and/or achieve organizational excellence. Corp Dev also pursues opportunities that leverage the value of the company’s business platform. roles. This article will go through each component of the WACC calculation. The cost of equityCost of EquityCost of Equity is the rate of return a shareholder requires for investing in a business. The rate of return required is based on the level of risk associated with the investment, which is measured as the historical volatility of returns. Learn the cost of equity formula with examples and download the Excel calculator is an implied cost or an opportunity cost of capital. It is the rate of return shareholders require, in theory, in order to compensate them for the risk of investing in the stock. The Beta is a measure of a stock’s volatility of returns relative to the overall market (such as the S&P 500). It can be calculated by downloading historical return data from Bloomberg or using the WACC and BETA functionsBloomberg Functions ListList of the most common Bloomberg functions and shortcuts for equity, fixed income, news, financials, company information. In investment banking, equity research, capital markets you have to learn how to use Bloomberg Terminal to get financial information, share prices, transactions, etc. Bloomberg functions list. The risk-free rateRisk-Free RateThe Risk-Free Rate of return is the interest rate an investor can expect to earn on an investment that carries zero risk. In practice, the Risk-Free rate is commonly considered to equal to the interest paid on 3-month government Treasury bill, generally the safest investment an investor can make. is the return that can be earned by investing in a riskless security, e.g., U.S. Treasury bonds. Typically, the yield of the 10-year U.S. Treasury10-Year US Treasury NoteThe 10-year US Treasury Note is a debt obligation that is issued by the Treasury Department of the United States government with a maturity of 10 years. It is used for the risk-free rate. Equity Risk PremiumEquity Risk PremiumEquity risk premium is the difference between returns on equity/individual stock and the risk-free rate of return. It is the compensation to the investor for taking a higher level of risk and investing in equity rather than risk-free securities. (ERP) is defined as the extra yield that can be earned over the risk-free rate by investing in the stock market. One simple way to estimate ERP is to subtract the risk-free return from the market return. This information will normally be enough for most basic financial analysis. However, in reality, estimating ERP can be a much more detailed task. Generally, banks take ERP from a publication called Ibbotson’s. 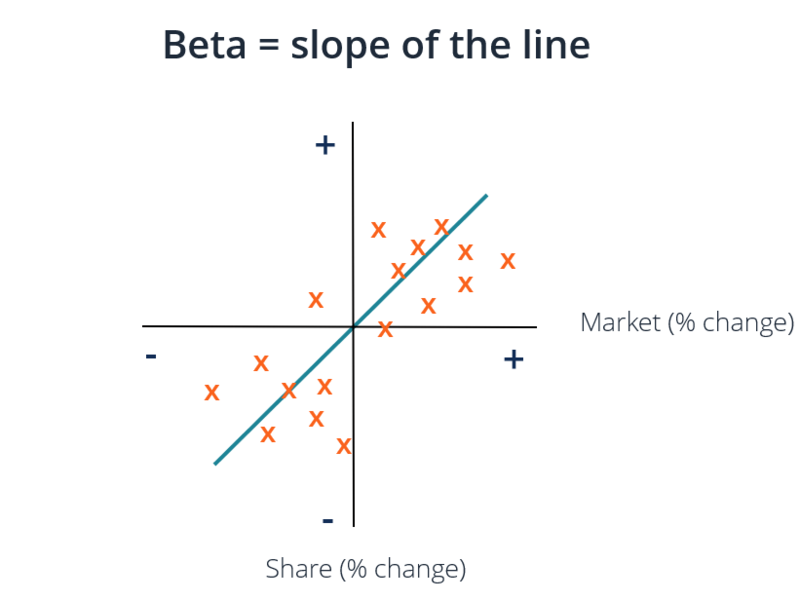 BetaBetaThe beta (β) of an investment security (i.e. a stock) is a measurement of its volatility of returns relative to the entire market. It is used as a measure of risk and is an integral part of the Capital Asset Pricing Model (CAPM). A company with a higher beta has greater risk and also greater expected returns. refers to the volatility or riskiness of a stock relative to all other stocks in the market. There are a couple of ways to estimate the beta of a stock. The first and simplest way is to calculate the company’s historical beta (using regression analysisRegression AnalysisRegression analysis is a set of statistical methods used for the estimation of relationships between a dependent variable and one or more independent variables. It can be utilized to assess the strength of the relationship between variables and for modeling the future relationship between them.) or just pick up the company’s regression beta from Bloomberg. The second and more thorough approach is to make a new estimate for beta using public company comparablesComparable Company AnalysisHow to perform Comparable Company Analysis. This guide shows you step-by-step how to build comparable company analysis ("Comps"), includes a free template and many examples. Comps is a relative valuation methodology that looks at ratios of similar public companies and uses them to derive the value of another business. To use this approach, the beta of comparable companies is taken from Bloomberg and the unlevered beta for each company is calculated. Levered beta includes both business risk and the risk that comes from taking on debt. However, since different firms have different capital structures, unlevered betaUnlevered Beta / Asset BetaUnlevered Beta (Asset Beta) is the volatility of returns for a business, without considering its financial leverage. It only takes into account its assets. It compares the risk of an unlevered company to the risk of the market. It is calculated by taking equity beta and dividing it by 1 plus tax adjusted debt to equity (asset beta) is calculated to remove additional risk from debt in order to view pure business risk. The average of the unlevered betas is then calculated and re-levered based on the capital structure of the company that is being valued. In most cases, the firm’s current capital structure is used when beta is re-levered. However, if there is information that the firm’s capital structure might change in the future, then beta would be re-levered using the firm’s target capital structure. 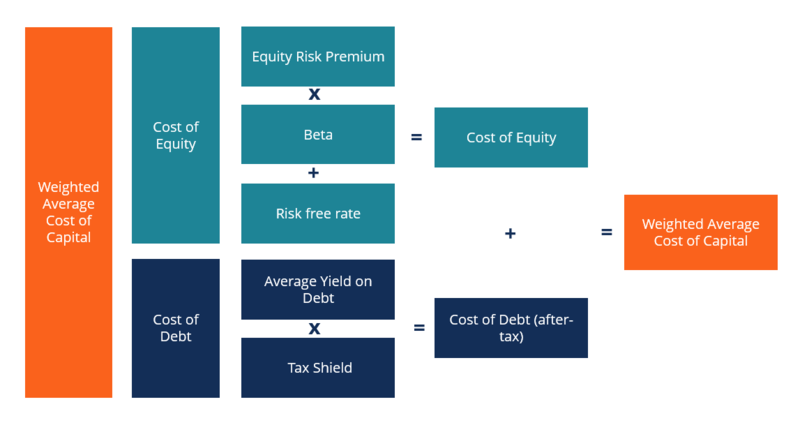 After calculating the risk-free rate, equity risk premium, and levered beta, the cost of equity = risk-free rate + equity risk premium * levered beta. Determining the cost of debtCost of DebtThe cost of debt is the return that a company provides to its debtholders and creditors. Cost of debt is used in WACC calculations for valuation analysis. Learn the formula and methods to calculate cost of debt for a company based on yield to maturity, tax rates, credit ratings, interest rates, coupons, and and preferred stock is probably the easiest part of the WACC calculation. The cost of debt is the yield to maturity on the firm’s debt and similarly, the cost of preferred stock is the yield on the company’s preferred stock. Simply multiply the cost of debt and yield on preferred stock with the proportion of debt and preferred stock in a company’s capital structure, respectively. Since interest payments are tax-deductible, the cost of debt needs to be multiplied by (1 – tax rate), which is referred to as the value of the tax shieldTax ShieldA Tax Shield is an allowable deduction from taxable income that results in a reduction of taxes owed. The value of these shields depends on the effective tax rate for the corporation or individual. Common expenses that are deductible include depreciation, amortization, mortgage payments and interest expense. This is not done for preferred stock because preferred dividends are paid with after-tax profitsNet IncomeNet Income is a key line item, not only in the income statement, but in all three core financial statements. While it is arrived at through the income statement, the net profit is also used in both the balance sheet and the cash flow statement..
Take the weighted average current yield to maturity of all outstanding debt then multiply it one minus the tax rate and you have the after-tax cost of debt to be used in the WACC formula. Learn the details in CFI’s Math for Corporate Finance Course. Below is a screenshot of CFI’s WACC Calculator in ExcelWACC CalculatorThis WACC calculator helps you calculate WACC based on capital structure, cost of equity, cost of debt and tax rate. Weighted Average Cost of Capital (WACC) represents a company's blended cost of capital across all sources, including common shares, preferred shares, and debt. The cost of each type of capital is weighte which you can download for free in the form below. Enter your name and email in the form below and download the free template now! Download the free Excel template now to advance your finance knowledge! What is WACC used for? The Weighted Average Cost of Capital serves as the discount rate for calculating the Net Present Value (NPV) of a business. It is also used to evaluate investment opportunities, as it is considered to represent the firm’s opportunity cost. Thus, it is used as a hurdle rate by companies. A company will commonly use its WACC as a hurdle rateHurdle Rate DefinitionA hurdle rate is the rate of return that must be achieved before accepting and funding an investment project. Hurdle rates are used in financial modeling to calculate NPV. If IRR > Hurdle Rate then the investment creates value. The rate is determined by assessing the cost of capital, risks involved, opportunity cost for evaluating mergers and acquisitions (M&AMergers Acquisitions M&A ProcessThis guide takes you through all the steps in the M&A process. Learn how mergers and acquisitions and deals are completed. In this guide, we'll outline the acquisition process from start to finish, the various types of acquirers (strategic vs. financial buys), the importance of synergies, and transaction costs), as well financial modeling of internal investments. If an investment opportunity has a lower Internal Rate of Return (IRRInternal Rate of Return (IRR)The Internal Rate of Return (IRR) is the discount rate that sets the net present value of an investment equal to zero. This guide to calculating IRR will give several examples and who why it's used in capital budgeting, private equity and other areas of finance and investing. If IRR is greater than cost of capital,) than its WACC, it should buy back its own shares or payout a dividend instead of investing in the project. NominalNominal DataIn statistics, nominal data (also known as nominal scale) is a type of data that are used to label variables without providing any quantitative value free cash flows (which include inflationInflationInflation is an economic concept that refers to increases in the price level of goods over a set period of time. The cause for inflation in the short and me) should be discounted by a nominal WACC and real free cash flows (excluding inflation) should be discounted by a real weighted average cost of capital. Nominal is most common in practice, but it’s important to be aware of the difference. CFI’s Business Valuation Modeling Course. Below is a video explanation of the weighted average cost of capital and an example of how to calculate it. Watch the video to quickly get a thorough understanding of how it works! Corporate developmentCorporate Development Career PathCorporate Development jobs include executing mergers, acquisitions, divestitures & capital raising in-house for a corporation. Corporate development ("corp dev") is responsible for executing mergers, acquisitions, divestitures and capital raising in-house for a corporation. Explore the career path. Learn more about the cost of capital from Duff and Phelps. Walk me through a DCF modelWalk me through a DCFThe question, walk me Through a DCF analysis is common in investment banking interviews. Learn how to ace the question with CFI's detailed answer guide. Build a 5-year forecast of unlevered free cash flow, calculate a terminal value, and discount all those cash flows to present value using WACC.